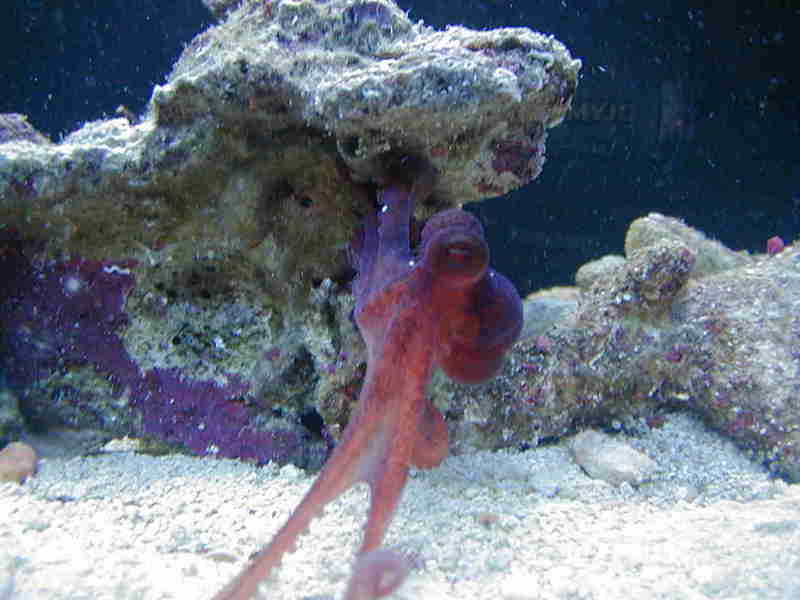 I found one in my Tank also, Heres a pic of him, about the same size as yours. I know you don't want to hear this but I suggest you get this guy out ASAP he is going to kill all your fish, they hunt them at night and all you find in the morning is half eaten bodies. The first thing he will consume is all your crabs then shrimp and lastly fish. They are very very smart and hard as hell to get out of the Aquarium, I suggest you get it right on the first attempt as he will never fall for the same trick twice. "It does look a lot like Octopus briareus, particularly the "web" at the base of its arms, but I don't think that's exclusively diagnostic. If your LFS is correct that it came from the Pacific then it is certainly not O. briareus. The question is whether or not the store really knows where their stuff comes from. Either way, its no dwarf!" Yeah he looks like My Octo Meatwad. go to www.tonmo.com and start reading. they can be kept they are not to hard once you know how. I ate tuna for lunch and now my fish keep giving me the stink eye!! Current Tank Info: several systems dedicated to different types of corals. all my fish were smaller then the ones i can see in your photos and if he's used to your feedings should be ok by now. oh yeh when i told my mate at the LFS what i had found in my tank he laughed so hard to himself cos he said yeh we wondered where that thing disapeered to.... Gee thanks! how bout some store credit then! Great find! Keep us up to date with some new pics! Current Tank Info: 37 Gallon Oceanic Cube, Various softies, 95 lbs of LR, 6 gallon cryptic fuge. Planning my 75 gallon upgrade. Wow, that octopus is awesome! Does it change colors? To see my tank, click the...Oh wait! Where did it go? Thats awsome. The same thing happened to me a couple years ago. He came in a turbo snail shell. Sadly there was a grouper in the tank and he didnt last very long. So, I have to leave him a variety when I'm gone, on the menu lists are: Manila Clams, Turbo Snails, Chromis, and Ghost Shrimps on the day I leave. I was just curious, but how is he catching fish? At night when they sleep? Do they ambush their prey, or inject a toxin that imobilizes the animal? Or, is it just their quick reaction and sharp beaks that take out the prey? Definately a great find. Hope he doesn't get too big for your refugium. If I hadn't poked it with my finger it wouldn't have bitten me!!! Current Tank Info: 125 g. display w/ 834 watt outer orbit (love the 8 moonlights!). 40 g. sump that has ~29 gal. algae scrubber built in. There is also an elevated 20g long refugium that returns water to the main system via an unfiltered skimmer/overflow setup. Btw if its doing well already and its in your fuge i dont see any reason to get rid of it. Sadly to say, this past Sunday coming home from a 10 day family vacation to discover that my Reef Tank was out of power maybe for a week long. Everything was devastated (I don't know what worst I can say), everything was black and an unbearable strong gross smell. I went to the back room cautiously and one of the plastic tubing from my RO unit burst, spraying water all over until it short circuited some of the electricals and tripped two of the aquarium main breakers. Luckily nothing caught on fire, it just completely shut down the tank. All of my Fish, Clams and Octopus were completely decomposed and the Corals are wiped out. My 7 years of hard work with this 180 gallon Reef Tank just went down the drain in a matter of days. I did not have a tank sitter so I set up an Auto-Top-Off, the additonal plastic tubing that connected to the RO's main membrane had some weak spots on it and was the main cause. I was confident and so proud of myself with the set-up everything was running nicely, the auto-feeder and the the food for the Octo was all ready. What a way to come home from a vacation, I would not wish this happen to anyone. What a bad feeling! I'm just a little messed up right now. Good bye everyone and good luck to all, thank you so much for all your compliments. ... and here are the last photos. Sorry to hear this. Good Luck! Very sorry to hear this. What a shocker back from vacation. Good luck. No one was in charge of your tank during those 10 days? IÂ´m sorry for all your losses, but keep going youÂ´ll be back in no time!